Figure 4.42. Laser/microwave heated MHD spacecraft operating envelope enabled by a series of propulsion configuration adaptations. that experiments projecting energy from Siberia to an orbiting satellite re-transmitting it to Moscow achieved the transmission efficiencies Tesla had predicted. The picture of the power generating tube Legostayev showed was identical to the tube the author saw at the small museum at Tesla's birthplace in Smilyan, Serbia. In both cases the evidence supported that a remote-powered vehicle was possible. Professor Leik Myrabo, of Rensselaer Polytechnic Institute, Troy, New York, has been developing a spacecraft based on focused electromagnetic energy (laser or microwave) for at least the last 20 years [Myrabo, 1982, 1983; Myrabo et al., 1987, 1998; Myrabo, 2001]. In this case the vehicles are toroidal, the toroid forming a mirror to focus the received electromagnetic energy to vaporize and ionize water and air. 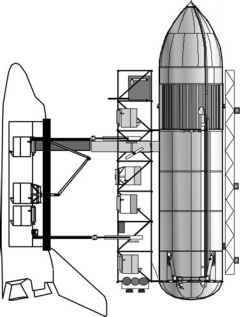 Thus the propulsion system becomes an MHD-driven space launcher. Myrabo has recently demonstrated with USAF support a scale model propelled by a laser at Lawrence Livermore Laboratory, as shown in an Aviation Week article [Aviation Week and Space Technology, 2002]. The importance of the Myrabo concept is that is truly a combined cycle concept. 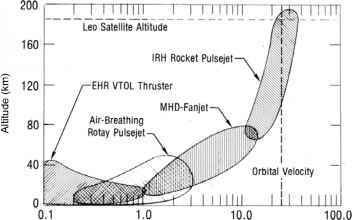 Through a series of propulsion configuration adaptations, the single spacecraft becomes four different MHD propulsion systems, all powered by projected power that can, in principle, reach low Earth orbital speed and altitude (Figure 4.42). The power projecting system can be on Earth or in orbit. If there is an orbital power generator, spacecraft can be powered to the Moon (see Chapter 6), or a satellite can be powered to geosynchronous orbit with a minimum of earthbound resources. If the power generator is placed on the Moon, then the system can provide propulsion to the nearby planets and moon systems. This concept is very interesting because it has the least onboard propellants of any system and hence the lightest weight. Figure 4.43. Laser/microwave heated MHD spacecraft by Leik Myrabo of Rensselaer Polytechnic Institute, Troy, New York. illumination of the laser windows provides lateral thrust, so sideways translation movement is possible as well as vertical. In this liftoff phase the propulsion system is configured for vertical takeoff or landing. Although forward acceleration to high subsonic speed is possible, the propulsion system soon transitions to the airbreathing rotary pulsejet mode. In this case the rotating outer ring provides linear acceleration by ejecting an air plasma from an MHD engine segment. As speed increases, the entire vehicle acts as an MHD airbreathing fanjet to cover the supersonic and hypersonic speed regimes. In its final configuration the pulsejet configuration now operates as a rocket, for instance with water as a working fluid (see Myrabo references for details). 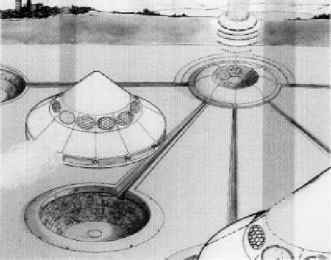 Since its inception, the concept has proceeded through a number of evolutionary steps, but the basic axisymmetric shape, with toroidal mirrors focusing the radiated energy to produce a plasma, still remains. Experimental data and the status of this technology can be found in [Eckel and Schall, 2008].